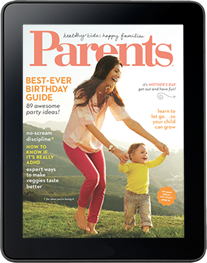 Explore new ways to connect with your kids … see the hottest new gear … get expert advice for raising healthy, happy children … whip up kid-pleasing suppers … browse our best buys & product recalls, plus much more! Digital editions with all the benefits of hassle-free automatic renewal are available on iPad®, select Android® devices, Nook® and the Kindle Fire®. All first-time subscribers receive a FREE trial. If you cancel your subscription before the end of your trial, you will not be charged. If you do not cancel the subscription, deliveries will continue and your default credit card will be charged the current monthly or annual subscription rate. Your subscription will automatically renew unless you choose to cancel. AMAZON, KINDLE, and the KINDLE FIRE are trademarks of Amazon.com, Inc. or its affiliates. NOOK is a registered trademark of Barnes & Noble, Inc. Also available through the Nook App on Windows 8. Available on the iPad and select Android devices, along with over 75 titles as part of Next Issue Unlimited. Also available through the NIM App on Windows 8. Get YOUR FREE TRIAL ISSUE now!